graffiti n (graph´ • it • ē′) 1. visual pollution inspired by major corporate signage advertising. I don't like taggers as much as the next guy, but when I think of all of the ugly outdoor signs I see on businesses and moving vehicles, it's an obvious losing battle that law enforcement plays with taxpayers money to rid the city of graffiti. With taggers, it's monkey see, monkey do. Next time you are buying your lunch, stop in front of the place where you eat and look up just before entering the door. Is it no surprise that management places their signs so high above ground so their logo isn't crossed out? Don't be fooled by the explanation that the KFC or the yellow arches places their sign so high in the air so that people can see them from a distance. It's true that people use these enormously placed signs for visibility; I find myself using them when explaining driving directions to people who need a visible landmark to identify a left turn. Perhaps filling stations like Shell, 76, Chevron, etc. might need their signs to stick out of the road, but whoever drives distances in search for a place to eat very likely might dread needing to stop at a fast food joint. Now with gasoline prices what they are, people may be more determined to pack a bike in their trunk and pedal out to the nearest home style eatery where one doesn't have to roll their eyes at the ordering menu in typical zombie fashion attempting to come to a decision to bite the clerk or just order a hamburger. There is a place in Brazil that is doing away with advertising. Read about it in the December issue of Time. There's also a cool montage of pix that Cory Doctorow links to from his boingboing entry. 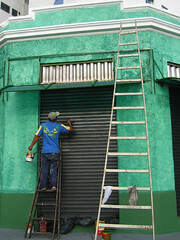 The photo of the greenish building being painted is one of the many photos dismantling signage in a business which probably relied upon the identifying marks for years. It comes from the same batch. Just click the link http://www.flickr.com/photos/tonydemarco/sets/72157600075508212/ to be taken there. I've a feeling that our friend , Don , probably does like taggers . He certainly goes for graffiti and Art Brut . That's right. I totally forgot about Donald-O. I personally don't read the writing on the wall the way a dedicated tagger might. There was a time when I felt differently, but the stress was overwhelming. If I had continued in that path, I'm sure I would contradict myself on the issues I take now about graffiti. But I did make an attempt to show a slight appreciation for the rebelliousness of it all. That I see corporate advertising just as monstrous shows I accept vandalizing of commercial signage displays. Personally , I agree with you in disliking mindless graffiti . I hate to see beautiful buildings defaced . The manufacturers of the spray cans should be obliged to produce erasing solutions . The last time I was in Paris I was horrified .